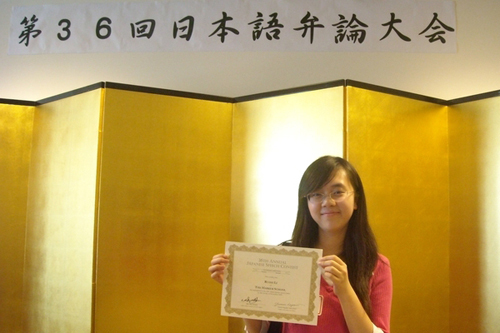 Senior Ruozi(Roslyn) Li participated in the 36th Annual Japanese Speech Contest last Sunday at the Japan Information Center of the Consulate General of Japan in San Francisco. She spoke about what she learned from the trip she took with her Japan Bowl teammates and her teacher (me) this past summer in her speech titled “Seeing is Believing” and successfully earned the second place in the category of non-native speakers. .Let me know if you need any more information about this..Photo by Mark Tantrum.